Field Marshal Garnet Joseph Wolseley, 1st Viscount Wolseley KP, GCB, OM, GCMG, VD, PC (4 June 1833–25 March 1913) was an Anglo-Irish officer. The number of letters after his name indicates just how glittering was his career. What first made him a household name – he is the original ‘Modern Major-General’ – was campaigning in Africa. In just one year he captured the two most powerful and dangerous potentates on the continent: Cetshwayo, whose Zulus had humbled the British in many battles including Isandlwana; and Sekhukhune of the Bapedi, whose warriors had twice beaten white armies, including a British one. Wolseley was ambitious, clever, lucky, insecure and a magnificent showman. The reader will love him or hate him as this arch-imperialist re-shapes southern Africa aided by a large cast of colourful and eccentric characters (men such as the adventurer John Dunn – who took forty-nine Zulu wives). Based on wide original research, with field trips to Africa to explore long-forgotten battle sites, and drawn extensively from hitherto unused material including over 600 of Sir Garnets letters, many to his wife, A British Lion in Zululand is a major addition to colonial history. William Wright’s analysis of the 1879 Anglo-Bapedi War is the most detailed account available and the chapters on the Zulu War, including the capture of Cetshwayo and the Zulu Settlement, break new ground. 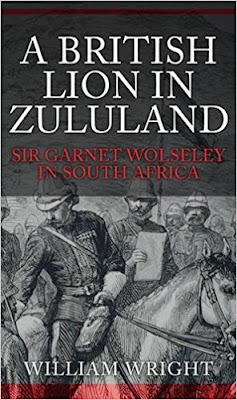 As the renowned American historian Charles Ballard has written, research into the end of the Zulu War and the disastrous settlement are a "long-neglected facet" of colonial history. This is now no longer true.